If you are like most people you are probably reading this article AFTER you have already attempted your first garden. If you are sitting there chuckling to yourself and nodding don't worry, it wasn't meant as a slight, just acknowledgement that we've all been there at one point or another. Starting a garden is fun for, those of us with the itch, so it's not really surprising that we tend to just jump right in is it? The problem that we run into is it's easy to start digging holes in the ground and filling them with plants, that's the fun part, but what happens after the novelty of the project wears off and you are trying to create a look that you want, and it's just not coming together? That is about the point that you step back and realize you really don't know what you are doing and you are not sure where to go from here. Again, don't stress about it, we've all been there. If you are reading this article then that means there is still hope! You've passed the first hurdle and realized that there comes a point where you just need to stop and do a little research before going any further. 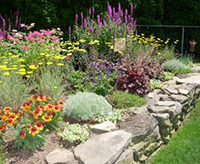 People go to college and take specialized courses to learn the In's and Out's of landscaping and flower garden planning, so it should come as no surprise that for us laymen types, we can't just jump right in and create stunning gardens on the first couple tries. Like anything else, experience is the best teacher. I have learned over the years that anything you rush into rarely comes out the way you intended in the end. 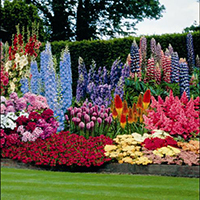 While it is not necessary to have an overly detailed plan drawn out, it is a really good idea if you consider a few essential points in your flower garden planning. Firstly, what are you trying to accomplish in your garden? Are you just looking for a collage of various colors and plants, or do you actually have a more definitive objective in mind? Obviously the more detailed your objective is, the more planning you will need to put into the project to achieve the desired result. 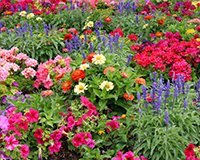 A lot of people will start off with a pencil and paper and start drawing out a rough draft of what they would like their flower garden planning to look like. I have to admit I am one of these people because I am terrible at picturing something just in my head. If I can't see my way through the entire project right from the start, I won't start it until I've come up with solutions for each road block I can think of. For me the easiest way is to sketch it out on paper and then work from there. If you are blessed with a creative spirit that doesn't require this step, kudos for you! Professionals will usually sketch out drawings of their landscaping ideas to show prospective customers, but this isn't generally for their own benefit. Professionals use sketches to not only provide a visual aid so the customer will have an idea of what the finished project will look like, but the mock ups are also an estimating tool the designers use to determine how many plants they will need and how much the project will cost. Each individual gardener is unique in the sense that we all will look at a given collection of plants in a different way. That is why it is important that you really try to come up with an idea of what you are looking for. It doesn't even have to be a specific goal. 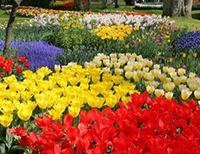 You could start off your project deciding that you want to add some bright colorful plants to an otherwise dull section of your yard. That's a perfect starting point. Colors are easy to find across a wide swath of plants and they can be coordinated rather easily, just like painting the rooms in your house; assuming you don't just go with eggshell white in every room! Once you have chosen the basic colors you would like in your garden, then you need to decide how much greens you may want. Just about every plant has some greenery to them, but maybe you want the colors to erupt out of a lush green garden. So then you will need to find a few complimenting plants that have blooms that fit into your color scheme, but whose primary goal is to add foliage and texture to your garden. 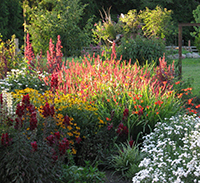 What I like to do in my flower garden planning is to start off with a focal point and work outwards from there. For an example say you have a nice cherry blossom tree in your yard and you would like to make a garden around it. I had 3 cherry blossoms in my backyard in a triangular pattern and decided to create a sitting garden in the center of them. Now I could have just put an iron table and chairs out there and called it a day, and in the early spring time it would have been a truly amazing garden. However once the trees were done blossoming, I wanted the space to continue to be beautiful throughout the entire year. So I started off bringing in some square ferns to place around the shaded areas of the garden. These added just the right amount of soft foliage that I was looking for. I put in several masses of Asiatic lilies to add to the feel of the garden. I sunk flat stones into the grassy area to form the "floor" of the garden, but I left them with a few inches in between to allow the grass to grow up a bit. Then all along the inside edge of the sitting area I lined with lilies of the valley which formed a short carpet of green leaves. The cherry blossoms brought in the spring with their stunning blooms, the lilies of the valley would follow shortly with their tiny white bells. By then the ferns would start opening up and filling out the garden space with their soft leaves, and the lilies would finish off the summer with their giant star blooms. This was one of those gardens that proved to me the real value of flower garden planning and we are so pleased with the way it turned out.